I am throwing this out there to see how much interest there would be in undertaking such a project. I have worked on and off on a game engine that has a more detail handling of regimental size units and Civil War combat in general. However, I realized in doing this that I don't have the time to take on the full project of developing both a game, graphics, scenarios, and support systems (web site) to do this. So the question I am throwing out is will the players as a group want to take on such a project? May people over the years have done parts of this for the club and supporting HPS/JS games. Mainly through the ACGWC web site, these forums, and individual efforts like Old Banshee's web site. Discussion forums since we need a way to communicate between the various members working on the project. Download support for the game file themselves which will probably be 2 GB. Membership management to keep the trolls out. And, all the various web pages that make up such a site. The graphics are the next giant size undertaking. If you want a "pretty" game it takes some artistic talent which I don't have. I draw stick men, trees, horses, etc. A lot of people would have to step forward to make the game look good. And last but not least is map and scenario developers. You just can't copy HPS games. There are probably some copy right problems doing this. That means original research. Going back to historic and modern maps and converting them into game maps. Looking at historic data to fill out OOB"s.
The game itself, CWE, also presents some limitations for players. It requires considerable resources in order to use higher resolution graphics and complex regiment simulations. This is a 64 bit Windows application requiring close to a gigabyte of memory to run. If certain decisions are made so that graphic files like Talonsoft used are made it could require over 2 GB to run. Many of our current members may have machines to old or not updated sufficiently to run such a program. The CWE was written as a Grognard's game. Not for the casual player. Anyway, it will be interesting to see what interest there is out there. I would be very interested in participating. There were some folks on the old Age of Rifles forum who aspired to build a new product, because Norm Koger was not interested in improving the game or communicating with players. Imagine that. A few of them were very knowledgeable, and would be valuable assets if we can reach out to them. Just to address a few things: the thing about maps is that in most cases basic terrain does not change--hills, valleys, streams, rivers, everything we need is out there to be built upon. Artistic license is called upon if we don't know where the historic woods and fields were, but maps can easily be done without copyright infringement. Are we using hexes? Orders of battle need to address lots of standard things in unit and leader capabilities. I have a unit numbering system from a database that I developed separately from the Org file system in HPS, so there is no copyright issue there if we use it or something like it. One of the great things about the HPS games is the potentially unlimited size of maps and armies. I would hope we could have that same potential. This sounds a great project. I don't have much time and IT knowledge to assist but yes I would be interested in supporting this initiative. I spent most of my entire working career as a programmer, primarily main frame languages, but some workstation development was involved. Haven't done any programming since I retired 6 years ago, but I am sure that I could learn the necessary language. Most of my years were spent developing statistical and rating algorithms for actuaries. Very complex mathematics. Depending upon time commitment it could be interesting. Also participated quite a bit in data base design, although that would probably not have a great deal of application for this project. Now there's an idea, Ken! I'm going to have to do some thinking on that, but I might be able to help out with the map graphics as well as forum creation. We will probably find ourselves using different terminology for various things, such as unit and leader ratings, just to not appear to be replicating what is featured in our HPS games. What suggestions are out there for what would go into the make up of a unit (regiment or battery) or rating a leader. Say, three attributes instead of the current two? 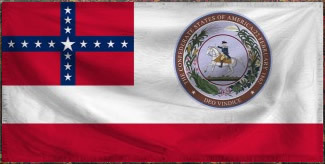 The game itself, which I refer to as CWE for Civil War Engine, is already written. It is in the debugging stage which is very tedious. Since all the code is in the free version of Visual Studio 2015, anyone could take a copy and debug a section of it. The coding itself is in Visual Basic which is a relatively easy language for anyone who has programming experience. I am considering one major change but it is one that I would want feedback on to see if people really want it. Right now the map is drawn using a system which is somewhat like what HPS uses with some of the methods used in Brother Against Brother thrown in. Although I probably used it before BaB did since I started working on this game on and off as early as 2010. Mostly testing which direction to go. The first version actually used 3D graphic engine but they changed how they licensed it which made me afraid to use it because of possible problems later. The big map question is do we want a map built up using hex graphics like HPS does or have a hand drawn map like Talonsoft did? Jus remember back when Talonsoft did them the game scenarios were a lot smaller. Something like the new HPS Gettysburg large map would require a gigabyte bmp file. As I said it a Grognard game. Hex size is 50 yards. A Regiment is simulated with up to five sections so can have a frontage of five hexes. Artillery is in sections of 1-4 guns. Line frontage is based on the actual length of a line for the density of troops. For example, if a 600 man regiment deploys in line in a single hex it would be considered to use 3-4 rows of men. If a 600 man regiment deploys in line in five hexes it would probably be in single line. Fire from a hex is based on how many are in the front lines. Effect of fire depends on the density of the formations in the hex receiving fire. Formations include Route Column, Column of Companies, Column of Divisions, Line (1,2, or more). In Column of Company you can put almost a whole brigade into a single hex. If that hex takes artillery fire everyone in it would take casualties and it would be terrible to see. Terrain includes about twenty types so far. More can be added. Hexside terrain likewise includes about dozen types right now. Some terrain are matter of degree: Light Woods, Medium Woods, Heavy Woods. Terrain graphics can be set up seasonal: Spring, Summer, Fall and Winter. Terrain can be destroyable like Cornfields. As fighting occurs they deteriorate. Weapon types are basically unlimited. Weapons fire is simulated. For example a gun firing a canister round produces a cone filled with a set number of balls that extend out in front of it. Based on the range it will have a killing area. Based on the target it will have a depth penetration and density factor. Based on the spread and these other factors it will have a probability of hitting one or more targets. Likewise for a rifled gun. It has a trajectory that determines it probably of a hit based on the target. In other words, all weapons are described by equations and the parameters are what define how effective they are. There is possibility of fire penetration into hexes behind the hex fired on by artillery. Artillery can fire Canister, Case, Shell or Shot. Ammo is tracked by each gun and soldier. An artillery gun includes the gun, caissons, limbers and horses as well as crew. All can take damage. Regiments include both the soldiers and officers represented by a regimental HQ. Headquarters for high organizations include their staff. The list goes on but that is what I can come up with off the top of my head without going to my ten binders of documentation and code. The game is a WEGO system. You give you units orders but they are not executed immediately. You can see where they will move to based on your orders but you don't know how long it will take to get there or if something will happen during movement to prevent them. WEGO has the advantage that you can actually go through the equivalent of a 20 minute turn in our current games in the same number of mailings. This is strictly a PBEM game right now, no AI. A game turn consists of a 10 minute move that is actually executed in six second increments. The reason you don't know how far your units will move is because it is really difficult to predict how what terrain they will cross or how their formation might effect that cost. The game has two fatigues, normal being tired from doing to much and battle fatigue. Both increase the cost of movement. If a regiment is moving as an extended line then the hex most difficult to move through sets the rate. For example you could order a large regiment to advance in two rank line which would require three hexes. Because you know there are enemy units on the right that will be firing at you, you can choose to refuse the right section so they won't take fire along the length of their line. But that regiment no longer faces the direction of movement so move slower than the rest of the regiment. This will slow the whole regiments movement. Putting the regiment in column of companies will make it move much faster without accumulating as much fatigue. But if it gets fired on by close range rifles or artillery you will pay a price. When a turn executes control of the regiment goes to the Virtual Colonel. He may decide the fire is to hot especially if someone fires into his flank and stop, or retreat. This is an almost continuous evaluation as the unit moves in six second increments. A unit also has place in a hex. It can be in the rear or the front. So movement along a hex diagonal consists of moving from rear to front, then to rear of next hex, etc. A large regiment can occupy up to five hexes. It can refuse either one or both of its flank sections. I am considering adding refusing two sections which would allow it to have a line almost covering a right angle corner. It can also assume a prone position (lay down). In Route Column a regiment might extend backward 3-5 hexes. Multiple regiments can be in line in the same hex but will affect density. When a multi hex regiment turns it actually has to go through the movement pivoting on its right or left end. The far end of the line will move through multiple hexes changing facing as it goes while the stationary end only changes facing. Graphic wise I took a top down view only. This makes uniforms other than identifying gray or blue difficult to do but it allows visually representing the formations and density easier. The unit graphic is built up from a single image of a man at about 10 to 1 density. So a 150 man line will be shown as two rows of about 15 icons. Random factors (apart from combat results)? Command & Control is one of the main areas I have not developed. Right now the Player has to issue orders directly to each regiment. There is no C&C but the HQ's for it are on the map. This is one of the big design decisions that have to be made. Is C&C passive like in HPS games where it only affects things like morale levels. Or active, that is, all commands must go down the C&C chain and regiments execute them to the best of their limited AI ability. There are good points to each view. Some people hate watching the game misplay their perfect plan. Then games like Scourge of War rely on the fact that the AI actually plays both sides with the Player only able to give higher level commands to make their games playable in single player mode. Sid Meiers did the same in his Civil War games. I haven't decided yet. I first want to get the mechanics down before I try to determine what to do with C&C. It will initially do like most games and affect only unit factors based on how close and ratings of officers. Randomizing result is in the game but not tested sufficiently. Right now a weapon's median casualty number is determine mathematically based on the weapon, ammo, distance and size of target. Once that number is determined then the bell curve is applied and a random selection put in. It averages out rather quickly since on a six second time slice all fire is by individual volleys. Units have to reload their weapons between firing using historic modeling modified by the unit's current fatigue and quality level. This all gives the final "Hit" number. Then the "Hits" are turned into casualties which may include one or all of the following: men, guns, caissons, limbers, ammo chests, horses, etc. Hits to men are further divided between kill, wound, stragglers and capture depending on the type of attack and weapon used. Stragglers are a side result due to number of casualties. They represent people who decide to "help" wounded or check out things in the rear. They also slowly return to their units. In other words, the CWE is a very complicate game engine taking into account so many factors that Players will have to develop a feel for the game rather than being able to say 400 men will always defeat 200 men. A fire fight tends to be very sudden, very short, and very deadly. If 200 men prone happen time rising up to fire just right and do it at close range firing one shot every 30 seconds, a 400 man regiment unprepared to receive fire can be destroyed in the ten minutes of a turn. Yes, but are there people willing to put time into making it happen? Test to see if I can find a way to display a screen shot. Got a link to photobucket to work. 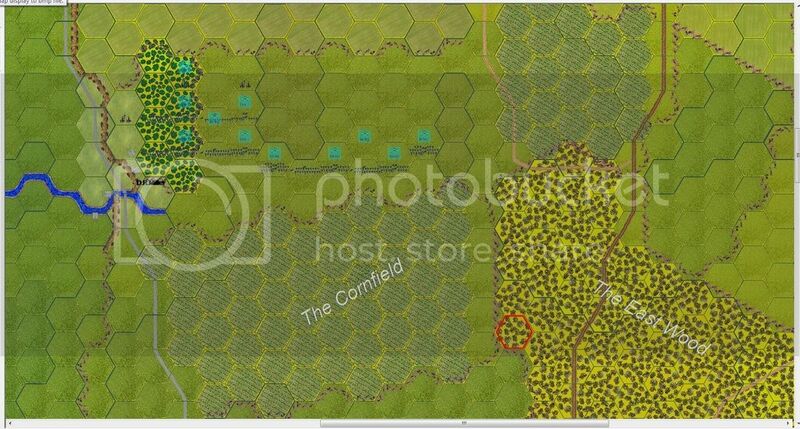 This is a screen shot of the Union positions just before their first advance into the cornfield at Antietam. Because of the cornfields the union troops have no visual sightings of enemy formations on the other side. If they did it would still be only an approximation depending on distance and how many units and their quality that sighted the enemy unit. I think we're on to something here. I've been tweaking scenario development for some time now and created a full game to run a custom scenario. I'm still working on a grand scenario covering the full CW on a division level. With the .pdt open for editing and many aspect of the game open we can do a lot. The only thing we are missing is the ability to do program editing. If you have the ability, or someone, to create an open source version, that would be GREAT. I would like to see ammo as a number in the OOB file so units use and run out based on the individual unit supply and not a random percentage. I would also like to add engineering units to create or repair rail lines. I would also like the ability to create a low level water unit and a naval or sea unit for deep water. In regards to the terrain, I would like to see the ability to change the terrain based on a weather condition. from green to mud to snow. Something like that. Those would be my early wishes to help complete my Grand Scenario of the full CW. I would also like to see that units are able to replenish their forces with recruits; if needed. This would be specific to the grand scenario version. Maybe have the ability to have rail and navel transport option as well. Just my early thoughts and input.